On October 27th, Kojo Stone debut his EP Ego Trip, which has been featured globally across media entertainment platforms. Song number six on the project, “Want To Be Loved” featuring TruthCity, is a testament to vulnerability and needing love at our lowest points. Being of service to others is an act of love! Kojo is using this song as a catalyst to his career of service; manifesting his love through small acts of kindness. On November 3rd, Kojo Stone x I.T.I.S. Entertainment volunteered for a charity event in Brooklyn for Help 1, a subsidiary of Help USA. With the majority of participants being elementary age children, there was no question that the youth at Help 1 was going to become a priority. With the holiday season around the corner, we wanted to dedicate all of Kojo Stone’s performances in December and January to collecting toys and winter clothing for homeless families that need our love the most. 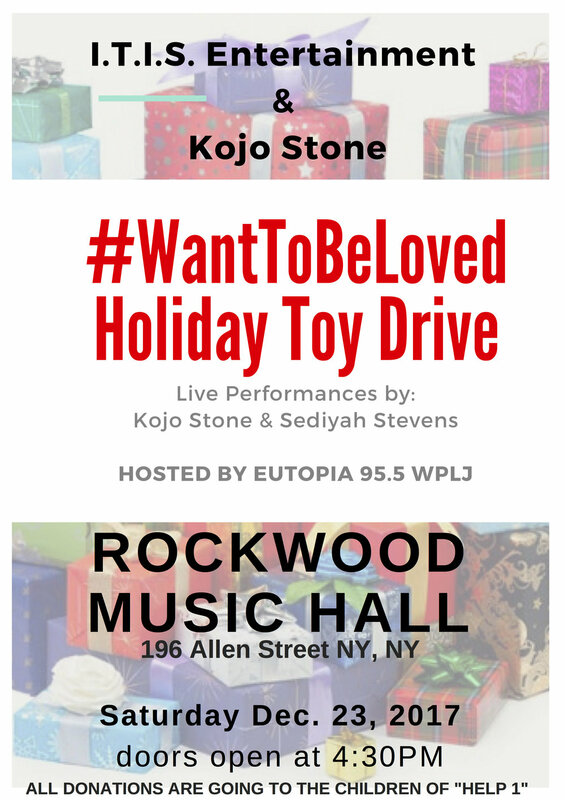 On December 23rd Kojo is performing at the popular music venue Rockwood Music Hall from 5pm to 6pm! We are asking people to donate toys and clothing for the children we met in November at Help 1. On December 24th from 6pm to 8pm with the help of radio personality Eutopia from Cumulus Media and 95.5 PLJ radio station, we will be giving away all that has been donated to the children at the Help 1 shelter. Music is an expression of love and love is a universal request, even when we hurt or disappoint others we are somehow asking to be loved in spite of who we are, recognizing our flaws and deficiencies can be the catalyst to our healing and becoming our most authentic selves. WantToBeLoved.org will be here to start or even change the way we talk about love, it seems the new social construct is a contest of who can be the most indifferent, who can be the coldest, or who needs love less. We all have different needs and we all want to be loved, that may look different for every single one of us. Some of us may need a little more love than others and some of us know how to love abundantly. Let's all put down our walls, be vulnerable, build bridges, and admit that we all want to be loved! So how do you want to be loved?